The year 2007 was my first year in which I switched completely to digital photography. The year started quite late due to a personal situation at home. The highlight of the year 2007 was my journey through the southern part of Germany. I made several visits to the American Air Base of Rammstein during this journey. I also had the opportunity to visit Neuburg which is located near Augsburg before the Phantoms would disappear later this year. The first Typhoons were already operational at Neuburg. I made also a visit to the spotter’s day at Kleine-Brogel in Belgium. Also the TLP was a constant factor this year with a few exotic participants from several countries. Today there was a trip scheduled to Metz-Frescaty in the morning and Liége-Bierset in the afternoon. At Metz, the intention was to attend a spotters day, unfortunately we were too late and we had to spot from outside the base. After a morning at Metz, we went to Liege-Bierset for the helicopter days. It was a good show with some nice demonstra- tions. The absolute highlight was the demo of the Hungarian Mi-24 Hind. It was the first time I got this helicopter in front of my lens. The demonstration of this helicopter was a real spectacle. The open house of the Royal Netherlands Air Force was again on the program in the period from June 14 until June 16, 2007. The open house was this year held at Volkel Airbase. The Air Force Organized a Spotters day during the arrival of the open house participants. This was done for the first time during an airshow. We had to report ourselves at 8 am at the gate on the southwestern side of the base. Once inside. The open house of the Air Force was nothing new this year, but I had some fun and therefore it was again a good airshow. My trip through the southern part of Germany would start at Ramstein Air Base. This airbase is the largest U.S. base in Europe. Ramstein is a major distribution center of the United States Air Force. Gigantic transport planes are flying day and night to and from Ramstein to drop or to pick up loads. A transport wing of the USAF is stationed at Ramstein Air Base. The 86th Airlift Wing of the USAFE (United States Air Force Europe) currently flies the C-130 Hercules and is using C-20 and C-21 for training purposes for the air crew. I would also spend the second day of my trip through the southern part of Germany at Ramstein AB. Many C-17 Globemaster III transport aircraft from various units within the USAF arrive and depart every day at this great base. This is a nice moment to take a closer look at this gigantic transport plane. The Boeing C-17 Globemaster III is one of the largest military transport aircraft of the USAF. The aircraft was designed for the U.S. Air Force and it was developed in the eighties by McDonnell Douglas. The USAF has more than 170 C-17s in service. I visited the exercise Elite at Manching-Ingolstadt on Wednesday, June 20, 2007. The exercise Elite took place at Lechfeld, but the F-18's of the Swiss Air Force were based at Manching-Ingolstadt for this exercise. The F-18 Hornett of the Swiss Air Force would act as the aggressor during Elite. Also the Technical Centre for aircraft and airworthiness “Wehrtechnische Dienststelle für Luftfahrzeuge” (WTD-61) is based at Manching-Ingolstadt in Bavaria in the southern part of Germany and was founded in 1957. On Wednesday, 20 June, I went to Neuburg. There are still some Phantoms at Neuburg and they are at this moment assigned to Jagdgeschwader 74. Neuburg is the second base which is going to operate with the Eurofighter Typhoon; Laage is the other base. The first Eurofighters have entered service already at Neuburg. Jagdge- schwader 74 (JG-74) is one of the four German air defense units. The unit is responsible for the air defense of the southern part of Germany. JG-74 was the last activated German Fighter Wing. A visit to the German airbase Lechfeld was on the program today. The goal was the Elite Exercise at this base. This had to be the best part of the Germany trip this year. Unfortunately, it became something else. The mission which would depart in the morning was cancelled due to the bad weather conditions in the target area which would be visited. This was a big disappointment. As an alternative we were able to make a tour over the base to view and photograph all the aircraft in the shelter area. This was a compromise for the cancelled mission. My final visit during my five-day trip through the southern part of Germany was again at Ramstein AB on Friday, June 22. Also today it would be a day filled with transport planes and tankers of the United States Air Force. Almost all transport aircraft of the USAF are assigned to the Air Mobility Command (AMC). The Air Mobility Com- mand (AMC) was established on June 1, 1992. The AMC was formed from elements of the Military Airlift Command (MAC) and the inactivated Strategic Air Command (SAC). On Tuesday, July 17, 2007, there was again a Spottersday on the program at the Belgian airbase Kleine-Brogel. This Spottersday is always a big well organized event by the Belgian Air Force. In the past, the Spottersday started as a good alternative for the Belgian airshow which disappeared due to cuts in fund. The Spottersday at Kleine-Brogel has built up a good reputation in the past; especially in Belgium and the Netherlands. The Belgian defense invites a list of visitors for the Spottersday by organizing a major exercise. There were a lot of helicopters involved in the exercise that was held today besides all the fighters at the Spottersday at Kleine-Brogel. The helicopters were mainly from Belgium, but this year also a SA330 Super Puma from the United Kingdom participated in the exercise. It was a nice combination of helicopters. The Belgian government decided that the helicopters would be assigned to the air component from July, 2004. As a result of this reorganization, the name Light Aviation was renamed to Heliwing. The exercise Redskin Challenge took place from Monday, September 11, until Thursday, September 13, 2007. This preparation exercise took place in the eastern part of Zeeland. The main goal of this exercise is the integrated action of air force units and ground units as a preparation for the mission in Afghanistan. The helicopter crews of the Royal Netherlands Air Force are trained during the exercise Red- skin Challenge. This training contains an integrated action between ground units and air force units. This week 12 F-16s from Leeuwarden Air Base were temporarily stationed at Eindhoven Air base. The goal of this exercise was the rapid movement of one unit to another airfield. The F-16s from Leeuwarden flew the entire week 2 missions per day, namely; one in the morning and one in the afternoon. I attended the afternoon flight on Wednesday, September 12, 2007. Photography at Eind- hoven is in the late afternoon a problem, because the sun is rotating to the other side of the runway; this afternoon brought me some nice shots. On September 18, 2007, I drove to Weelde Belgium. The reason of this visit were three storage F-16 which would depart from the storage. These F-16s are all sold to Jordan. The F-16s were towed from the storage area to the runway. They were prepared by the ground crew at the head of the runway. The aircraft would leave Weelde via the air. The pilots of the F-16s arrived in the morning hours with an A-109 from Bierset. I managed to catch a few nice shots of the helicopter. The F-16 were started at the head of the runway. 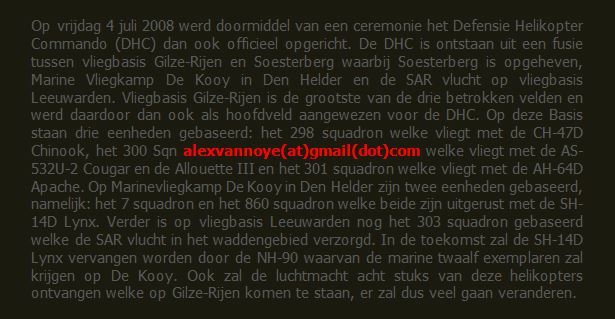 Also in the year 2007 I made just like in 2006 many hours at Gilze-Rijen Air Base. Gilze-Rijen is still a very quiet base and not much happened in the year 2007. In September there were a number of Jordanian Air Force Hercules Aircraft present at Gilze-Rijen. These aircraft were here to pick up the Royal Jordanian Falcons after their airshow season. These aircraft were very special to me, because I never had the chance to capture them before. The year 2007 was not a special year with many movements; only the helicopters flew much. On Tuesday, October 9, 2007, I went to the TLP at Florennes. This TLP was the fifth edition of the exercise this year already and there were a number of special planes involved. This time especially the Italian participation was large with two Tornados, two AMXs and two F-16s. It promised to be well again. The TLP mission today was a long range air to air refueling mission. The participants of the TLP will take off earlier than usual during these kinds of missions. Usually, this mission will be performed over England at the shooting range. On Tuesday, December 4, 2007 I went to the last TLP of the year 2007 at the Belgian Florennes. My main goal of this TLP edition was the participation of the Italian Navy Harriers. There were no fewer than five of these aircraft present at Florennes. My goal was to catch at least four of them on photo. There are fourteen AV-8B Harriers and two TAV-8B Harriers in operational service in the Italian navy. This aircraft is used to fly from the aircraft carrier Cavour. The AV-8B is a subsonic attack aircraft and its powered by a Rolls-Royce Pegasus turbofan.